Given the level of knowledge and scientific breakthrough over the years, new HIV/AIDS-related infections and deaths are in principle preventable and controllable. This has therefore allowed for the disease to become manageable by many health sectors across the world, including the local Ministry of Public Health. 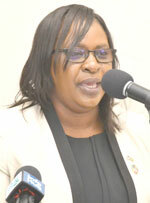 As she considered the significant progress that has been realized in the fight against HIV/AIDS, Minister Cummings noted that when the HIV outbreak first started, most individuals developed AIDS in about eight to 10 years. In fact, she recalled that once a person was diagnosed with AIDS, he or she had, at most, a two year life-expectancy rate. “Having HIV/AIDS was literally a death sentence, but thanks to advances made in the sciences the statistics have changed, in fact HIV is no longer a terminal illness it is classified as a chronic manageable disease,” said Minister Cummings. But despite the efforts aimed at furthering the advances made, Minister Cummings disclosed that there continue to be some factors that could threaten the laudable gains made. Primary among the threats, she shared, is stigma and discrimination. From fears of contagion to negative social judgment, many persons in society often unwittingly engage in and encourage varying degrees of stigma and discrimination against persons living with HIV/AIDS, the Minister noted. But this situation is certainly not a new development. Minister Cummings recalled that early in the history of the epidemic the late Jonathan Mann, former head of the World Health Organisation’s Global Programme on Acquired Immune Deficiency Syndrome [AIDS], had identified AIDS-related stigma and discrimination as a third epidemic following the accelerating spread of HIV infection and the visible rise in AIDS cases. She however asserted that tackling the factors that were outlined by Mann continues to be the key to preventing HIV transmission and mitigating the impact of the disease on individuals, families and communities. For this reason, the Public Health Minister said that an essential part of the Fast Track Initiative to end AIDS is the inclusion of key populations who are being left behind in the HIV/AIDS response. This mainly occurs, the Minister noted, because of stigma and discrimination which severely impacts negatively on persons who refuse to be tested or refuse to reveal their HIV status and ultimately are left untreated. “Though it is controversial and often avoided, as health care providers responsible for the health and wellbeing of our fellow human beings, we cannot be blinded by prejudice and insular judgment. If we are truly committed and determined to take the fight to the HIV/AIDS epidemic, then we must demonstrate that resolve by working with persons with HIV, including the key population component,” Minister Cummings underscored. Turning her attention to an article published in the UN Chronicle, Minister Cummings shared how the World Faith community has made good progress against the spread of HIV/AIDS by using individually focused informed messages such as the ABC Strategy. The ABC Strategy is: Abstinence, Being Faithful, Condom Use, and the implementation of policies, programmes and budgets that are simple, morally appealing, politically convenient, financially lenient and scientifically relevant. “For greater and more sustainable successes against HIV/AIDS, such messages can be utilised in the Guyana context,” said Minister Cummings as she concluded that religious leaders can help to play a vital role in helping to furthering the achievements of the health sector. Empowerment through education – at the individual, family, local, community and national level.